In today's Gospel, we heard the story from the Gospel of John of the woman caught in adultery. Of course it is the source of the famous anecdote, "Let he among you who is without sin cast the first stone" (cf. John 8:7). This is one of the best known sayings of Jesus, but I also believe that this story as a whole is one of the least understood. What was Jesus really saying when He said, "Let he among you who is without sin cast the first stone"? The story if often made into a moral about not judging. The assumption is that the Pharisees were being harshly judgmental in publicly accusing the woman of adultery. In their insistence that she suffer the penalty of death they are calling for a strict application of justice without any mercy. When Jesus says, "Let he among who is without sin cast the first stone", our Lord is reminding the Pharisees that everybody is a sinner and we are all in need of God's mercy. The people holding the stones, reflecting on their own sinfulness, suddenly realize they are in no position to pass judgment on the sins of another and go away. Then Jesus mercifully forgives the woman and sends her on her way. The central assumption of this common interpretation is that, when confronted with Jesus' comment, the Pharisees realized that they were all sinners and that they had no moral standing to insist on the punishment of another sinner. How can they insist on the punishments prescribed by the law when they themselves are also guilty of breaking the law? First, the Pharisees were not being out of line by accusing the woman of adultery. It was not as if this was some unfounded rumor and the Pharisees were jumping to a hasty conclusion. The text says she was caught in the very act (v. 3-4); the Pharisees were neither being judgmental nor hasty in their conclusion. Second, recall that the Pharisees were not actually insisting that the woman suffer the death penalty. The Pharisees merely noted (rightly) that the Law of Moses called for the death penalty and asked Jesus "what do you say?" (v. 5) They were not insisting that Jesus stone the woman; they were asking for His opinion. Why were they asking? The Scriptures tell us it was so that they might find some matter in which they could accuse Him (v. 6). Accuse Him of what? To whom? 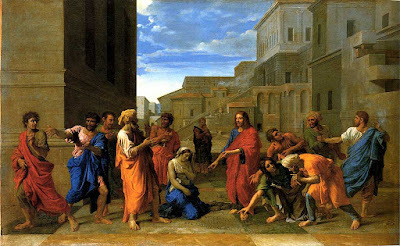 When the Pharisees set traps for our Lord, they did so in such a manner that no matter what answer He gave He would stand condemned, as in the famous example of the Temple tax ("Don't you pay taxes to Caesar?"). Their questions are set up for Him to be inescapable dilemmas. If that was the case, it does not make sense that they would be trying to urge our Lord to stone the woman. It has to be the case that whatever course our Lord takes - death or clemency - He somehow stands condemned. We understand that if Jesus opted for clemency, the Pharisees could accuse Him of being a lawbreaker, since the Law of Moses specifically commanded death for adulterers (Lev. 20). But how could Jesus stand condemned if He agreed with the application of the death penalty? To answer this, we need to ask about whom the Pharisees were hoping to accuse Jesus to. If He refused to execute the woman, they could accuse Him to the people as a lawbreaker. But if He carried out the sentence? It is evident that the only answer would be the Roman authorities. If Jesus insisted on executing the woman, the Pharisees would have grounds to make an accusation against Jesus to the Romans, for the Jews under Roman occupation were not allowed to put anyone to death (John 18:31). The right to execute a capital sentence resides with the sovereign alone. Forbidding the Jews from carrying out the death sentence was an expression of Roman sovereignty. Conversely, if Jesus were to command an execution, it would be tantamount to His denial of Roman sovereignty - a claim to exercise a power independent of Rome. Our Lord would stand condemned as a rebel against Roman power in Judea. Thus, if Jesus refuses to execute the sentence prescribed by the Law, He is a lawbreaker and could lose credibility with the people. If He agrees to execute the sentence, He makes Himself a rebel against Rome. Either way, however He chooses, He stands condemned. It is an impossible dilemma. Thus - and this is pivotal - when Jesus stands up and says, "Let he among you who is without sin cast the first stone", He is not so much making an appeal to the Pharisee's conscience to consider their own sinfulness; rather, He is throwing the dilemma back upon them. Here's how. What is often forgotten in this story is that the Pharisees really did believe they were without sin. When Jesus says "Let he among you who is without sin cast the first stone", this phrase was not likely to phase the Pharisees the way we assume, because the Pharisees actually assumed they were sinless. They assumed their adherence to the Law of Moses and the traditions of the elders rendered them righteous in the eyes of God. Jesus' statement cannot be construed as an appeal to their conscience. In their conscience, they believed they were sinless. As further evidence of this, we must remember that the Law of Moses never stipulated that those who carry out the penalties of the law must themselves be sinless. Not once does the Old Testament ever infer such a principle; therefore, there is no justification for thinking the Pharisees were pricked at their own sinfulness. We have already noted that the Pharisees did not believe themselves to be sinners - but even if they did acknowledge they had sinned, there is no reason to suppose this would have stopped them from carrying out the sentence, since the Law of Moses never said those who carried out the precepts of the Law needed to be sinless themselves. This and the prior consideration lead us to see that it is not possible that Jesus' words were intended to prick the Pharisees' conscience about their own sinfulness. What did He intend, then? By saying, "Let he among you who is without sin cast the first stone", Jesus is quite cleverly throwing the dilemma back upon the Pharisees. Those who are without sin are the best judges of what is the prudent course of action in a given situation; since the Pharisees claim to be such, let them render a judgment. This puts the Pharisees in the dilemma they intended to trap Jesus in. Now it is the Pharisees who must choose between being lawbreakers and rebels. This is why Scripture specifically says that it was the old men among the crowd who dropped their stones and walked away first (v. 9). This is another indication that our Lord was not intending to prick their conscience about their own sinfulness. The elder, who were wiser, understood the bind our Lord had put the Pharisees in before the younger. They immediately knew they were beaten and went away. It took the younger ones awhile to figure out what had happened. Thus, rather than seeing this story as our Lord appealing to the conscience of the Pharisees to recognize that we are all sinners, our Lord's actions actually presume that the Pharisees consider themselves sinless - this is why He is able to take the trap they laid for Him and turn it on them. It is not an appeal against judgmentalism and self-righteousness; rather, it is a clever game in Jesus uses the Pharisees' own assumed sinlessness to make them run afoul of Rome's law if they insist on carrying out the death penalty. There remains only one question - the Scriptures clearly say that when the Pharisees approached Jesus, He was bent over and writing in the dust with His finger; this is mentioned twice (v. 6,8). But, tantalizingly enough, the Gospel does not say what He was writing. What was Jesus writing in the ground? This is perfectly applicable to what the Pharisees were doing to Jesus in John 8. They intended to make our Lord dismayed, but the dismay they intended to bring upon Him was turned upon their own heads. Thank you for that analysis. Beautifully done. This analysis made me "aahhhhhhhhh" out loud. Very well done. I'd often felt like there was something missing in the conventional analysis of the passage. This analysis seems incomplete. What purpose does the story have if read as you so persuasively suggest? What message is intended by the Primary Author. It does not seem sufficient to suggest that the point is that Jesus was clever. Let us be gratefull to God, Boniface, for He is the One who gave you the light to write this down. Well I guess first I would question the assumption that every Gospel passage has to have some intenional meaning by the primary author beyond simply recording what happened. I do believe that some Gospel passages exist merely to state the facts of what happened - what was Mark's intent when he wrote Mark 14:51-52, or John's when he wrote John 20:7. I think you would hard pressed to come up with reasons for those passages beyond just retelling what occurred. But, in this case, I think there is a message. Of course, the principle "Let he among you who is without sin..." still has a deep relevance, even if it wasn't uttered in the context we are used to. If one presumes to take the burden of judgment upon themselves, let their judgments proceed from a pure heart - otherwise, better to not judge at all. But, like other passages in John in which Jesus encounters the Pharisees, I think one purpose is to demonstrate the wickedness and willful blindness of the Pharisees in their attacks on our Lord, much like the case of the man born blind in John 9. Such a clever trap could only have been the creation of minds very willfully in denial of our Lord's claims. It would tell faithful Christians, "Are you being persecuted by the Jews? Take heart; they did the same to our Lord when they laid traps for Him. But just as He confounded their arguments, so will you overcome against them." That is my arm-chair Bible scholar guess. I've never heard that interpretation of this story before, and I really like it. I remember once watching a TV dramatization of the life of Jesus, and that other episode you mentioned, about paying taxes to Caesar, was done with a nice little touch. The Pharisees stage their little trap in public, of course, and there are a couple of Roman soldiers standing by, listening carefully. *They* immediately can see what the implications of the questions are too. And when Jesus gives his answer, the 2 soldiers chuckle before they go on their way - they enjoyed seeing this clever guy outwit the Pharisees who were trying to get him into trouble. The other thing about this story, though, is that there WAS someone without sin in that crowd - Jesus himself. He had the best right to punish the woman for her sin, but instead he told her to sin no more and sent her away to do better. Very interesting and provocative! I would only add: please correct the illiterate error (as it's called) of your citation of the verse: "Let HIM among you, etc." "Him" of course is the object of "let." I wouldn't want first-time readers linking to your article only to be greeted with this grammatical error. Fr J. Interesting perspective and I enjoy innovation as long as it holds up, as this certainly does, but I've never heard of it or read it anywhere in my five years of being a Catholic or before that, so I'm not going and accept it at face value to conveniently ignore the mercy and purity before judgement aspect (as opposed to the errant non-judgement theory). That is how most people would use this, you know. Have you ever seen even a hint of such a interpretation? I have heard it from some biblical scholars before...I actually think Dr. Scott Hahn suggested this interpretation once as well. But please note, its not as if the "non-judgmental" theme is not at all present; of course, the principle "Let he among you who is without sin..." still has a deep relevance, even if it wasn't uttered in the context we are used to. If one presumes to take the burden of judgment upon themselves, let their judgments proceed from a pure heart - otherwise, better to not judge at all. Boniface, this was fantastic! Explains so well a much misunderstood event in Biblical history. Many Liberals in particular, and those deceived by them, use the passages on judgment as a cudgel to demand that we never point out transgressions. As I read it, it seems clear that the Lord reminds us that we are all sinners, that there is not one good among us, how can we ignore the log in our own eye, and this is critically important to our understanding of Christ's victory over death and its necessity for each person on earth. To twist this into a vow of observational silence has, I fear, been consciously used by the enemies of Christianity to silence the faithful on issues of morality. Your analysis is very thoughtful. However, I still think your conclusion was too confined. If Jesus and the church only preached to those open to the gospel... Very few are. It's the mystery of God's grace, God whose power created the universe and brings souls to Himself, while yet respecting our wills to embrace or refuse His offer. There is a mystery that remains despite our theological understanding. Not sure if I'm making my point or not. The pharisees believed they were sinless. So what. Most small c Catholics today believe they are without sin. I think the point you did not develop sufficiently when you discussed the universality of sin, which those SELF-RIGHTEOUS pharisees excluded themselves from. There is no reason to assume that Jesus was only making one point or putting them in their place. And like you said they were motivated to defeat Jesus. No question about that. It's my belief that Jesus was condemning them for their harsh judgementalism(I think you're right about the death penalty)which always comes from SELF-RIGHTEOUSNESS which may have been His main point. And "Let he who is without sin...", I don't see any possibility that this was just general information without a deeper meaning. Consider this: We are wounded by Adam's sin of pride. It's universal. And where there is pride, there is self-righteousness. Great work Boniface. Whenever I hear a scripture interpretation, I usually turn to the commentary by Fr. Cornelius Alapide. The commentary contained in his text is very similar to yours as well!